Science Explained: How Does the Milky Way Really Look? Astronomers recently mapped a new region of the Milky Way, which begs the question: Do we really know what our own home looks like? Recently, astronomers took advantage of a unique telescope to capture a remarkably detailed image of the southern region of the Milky Way galaxy. The Atacama Pathfinder EXperiment (APEX) telescope located on the Chajnantor Plateau in Chile was able to give us an unprecedented view of the cold dense gas distribution along the Milky Way’s galactic plane. As you can tell, these images aren’t exactly the wondrous swirls that we typically see when we look at other spiral galaxies. That’s because what we are seeing is the galactic plane head on. The James Clerk Maxwell Telescope, among others, had previously mapped out the northern region of the Milky Way galaxy, but the mapping of the southern region makes way for the inclusion of the Galactic Centre. The APEX is made up of very sensitive instruments, one of which is called the LArge BOlometer Camera (LABOCA), which is used to measure incoming radiation. It does this by detecting subtle spikes in temperature and emissions of stellar light that are obscured by cold dark dust bands, ultimately revealing previously hidden portions of the Milky Way. But just how much of our galaxy is really unknown, and how much have we really seen? 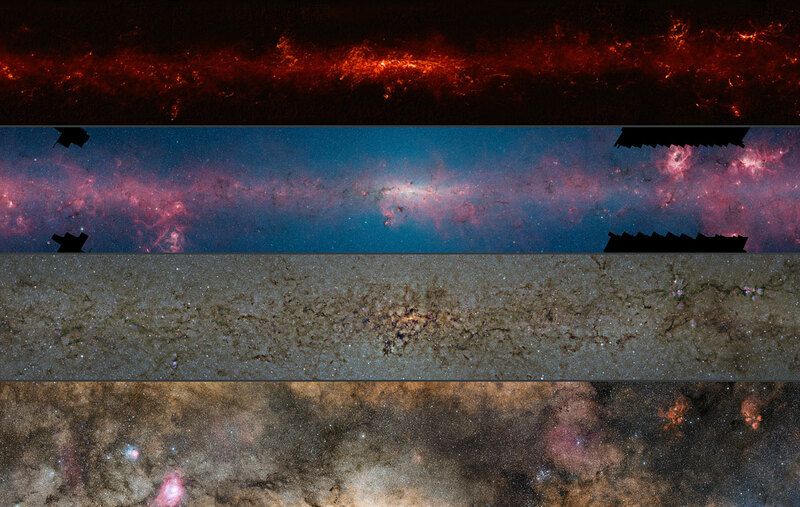 These new images prompt a rather interesting question regarding the way that the Milky Way looks. Namely, how do we even know what it looks like? Given that we are within it, can we ever actually see it? Trying to image the Milky Way is like trying to take a picture of an entire house while you are inside it. You just can’t do it. Of course, with houses, things are easy. All you need to do is open the door, walk for a little bit, turn around, and snap an image of the house. However, our galaxy is some 100,000 light-years across. It would take us quadrillions of years to travel to its edge. Yet, despite that, we still have a pretty clear picture of how it looks. We know that it is a rather typical large spiral galaxy. As previously noted, it is about 100,000 light-years wide, and we know it contains between 200 billion and 400 billion stars (and billions and billions of planets). 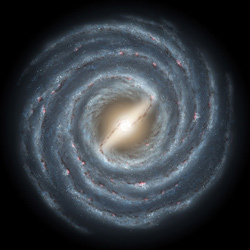 We also know that the Milky Way has four spiral arms, and that two of these arms flow from each end of a kind of ‘bar’ that spans across the middle of the galaxy. But how do we know that it is a spiral? How are we able to make artistic renderings of it like the one shown to the right? In brief, we can look at other galaxies and compare them to what we glimpse when we look at our home galaxy. By recognizing similar structures, we can identify which galaxies look most like our own and, thus, determine what the Milky Way most likely looks like. Of course, we can also see a lot of the galaxy by looking across the plane of it with our various telescopes, revealing many features. But of course, we don’t have a true picture of what it looks like. Mark Reid, Senior Radio Astronomer at the Harvard-Smithsonian Center for Astrophysics, explains more in the video below.